The doomsday scenario for BJP, projected by the BSP and SP citing their combined might, appears to be at variance with the situation on the ground after individual career-best performances in 2007 (BSP) and 2012 (SP). It didn’t matter to the Jatavs that barely a few kilometres away, in Koirala Chauraha, Union Minister Rajnath Singh had landed to campaign for the BJP candidate in Hathras Lok Sabha constituency. Chhoteylal and his group were not going to make the effort to go for the minister’s rally — this was April 6. In Bastoi village too, not far from Rajnath Singh’s meeting venue, Chandrapal Prajapati, belonging to the extremely backward Prajapati caste, decided to stay home. But his voting preference appeared to be the minister’s party. “The BJP has done good work. There is no fear in the air now. Law and order is good. It’s better to go and vote than show your face at a rally,” Prajapati said. Two different responses, only a few kilometres apart. And this variation in vote preference has been across communities, across Lok Sabha constituencies in western UP — Aligarh, Mathura, Fatehpur Sikri, Mainpuri, Firozabad, Etah, Amroha, Aonla and Nagina — that will vote in the coming phases. The social demography, the tone and tenor playing out in myriad ways, suggest that different assumptions behind best-case scenarios visualised by either side — the incumbent BJP and the Opposition mahagathbandhan of SP, BSP, RLD — could be at variance with the ground reality in the battle for 80 Lok Sabha seats in Uttar Pradesh. Anchored in the 1993 experiment, when the alliance stitched by Mulayam Singh Yadav and Kanshiram had stopped the BJP from returning to power in UP post the Babri demolition, the mahagathbandhan votaries believe that the sky is the limit for their combined might, the prism effect of their career best performances when they independently won the state not very long ago — SP (2012) and BSP (2007). Strategists within the BJP, in contrast, ward off doomsday suggestions, of getting run over by the elephant-cycle combine, and point out that the party stood ahead of the SP-BSP alliance even in 1993, winning 177 seats against the 176 of SP-BSP in the state polls. Both, however, appear to be discounting crucial differences inherent in the responses on the ground, in contrast to their assumptions projecting best-case scenarios. For the BJP, the above responses suggest that 2019 is not quite 1993, when the SP and BSP were fledgling parties trying to carve a niche for themselves, engaged in politically organising their core support bases, Yadavs and Dalits, under their flags. The reactions of Jatavs at Nagla Keshon in Hathras, declaring support for the SP candidate, and of Yadavs in Kundakhurd in the Noorpoor assembly segment of Nagina Lok Sabha seat, where Yadavs constitute a very small fragment of the electorate, reveal the robust political organisation of the BSP, SP core support bases, and that the task which began in 1993 has been completed. Their core supporters are not only ready and alert to transfer votes to the candidate of the alliance partner but also ready to discount grudges over candidate selection. So, the SP-BSP of 2019 is much more formidable than 1993 when BSP polled about 11 per cent votes and SP about 18 per cent, and together fell short of the BJP in terms of vote share and seats. However, the doomsday scenario for BJP, projected by the BSP and SP citing their combined might, appears to be at variance with the situation on the ground after individual career-best performances in 2007 (BSP) and 2012 (SP). The response of Chandrapal Prajapati at Bastoi in Hathras is reflective of the change since the peak performance days of SP/BSP. Prajapati had voted BSP before Narendra Modi took the BJP national stage. “They will either build Ambedkar villages or Lohia villages. What do I get?” said Amar Singh of Padam village in Jasrana assembly segment of Firozabad Lok Sabha constituency. A subsistence farmer from the Kushwaha community, his children run a chaat thela in a nearby town. Before 2014, his vote was for the BSP. “The mahagathbandhan candidate was never seen or heard in these parts,” said Antram, a farmer in Fatehpur Sikri, also from the Kushwaha community. He had voted BJP last time but was now looking to vote for Raj Babbar of the Congress. Before 2014, he and his friends used to be BSP voters. In fact, many BSP and SP voters — those outside their core base — don’t seem to be returning to the fold. There are people like Ajay Pal, a medic at Bhatauli in Dataganj assembly segment of Aonla Lok Sabha constituency: “Given the kind of works and schemes undertaken without any discrimination, I think I should try BJP once more.” From the extremely backward caste of shepherds, Pal said he and his family used to vote for SP before 2014. One comes across several such respondents among the numerically small and less dominant communities which used to vote for either SP or BSP before 2014, but now do not plan to return to them despite the alliance. Their reaction reflects that the individual support bases of SP and BSP are a shadow of their previous best performances in 2012 and 2007 respectively. In 2019, they remain stripped of the wider support base outside the core. To sum it, the bad news for BJP is that the SP and BSP of 2019 are not the same as that of 1993. 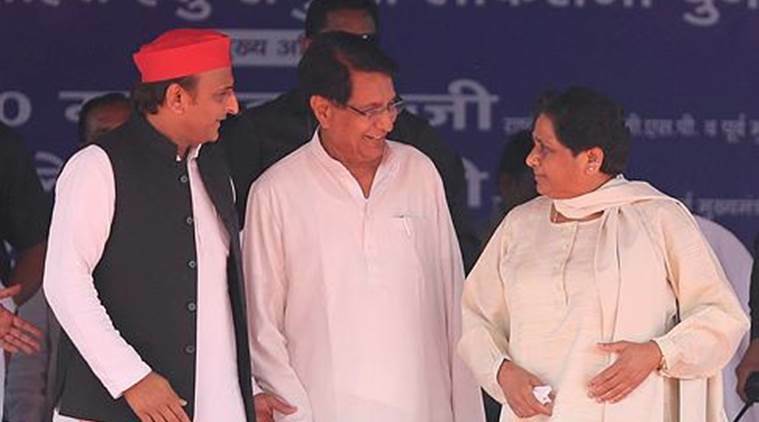 Likewise, the bad news for the mahagathbandhan is that the SP and BSP of 2019 are not the same as that of 2012 and 2007.